It was a different age as Jews licked their wounds from persistent European pogroms; the “Great War” between the Allies and the Central Powers of Germany and Austria-Hungary ended in 1918; only18 years previously, the Wright Brothers sent the first gasoline-powered Flying Machine into the sky; and the British Mandate had just taken over from the Ottoman Empire and ruled the Jews and Arabs in Palestine (Eretz Yisrael). Although the great Jewish theoretical physicist had left Europe in April 1921 to speak in New York for the first time, he did not document his experiences with pen and paper, and had never before traveled eastward. On that first visit to the U.S., he was accompanied by Chaim Weizmann (then president of the Zionist Organization in London who eventually became first president of the State of Israel in 1949 and a renowned chemist in his own right). The aim was to raise money for the planned Hebrew University in Jerusalem whose cornerstone was laid in 1918 and which opened in 1925, as well as to forge ties with the American scientific community in the wake of the World War I. These personal connections were fortunate, because with the rise of Hitler and Nazism in 1933 and fearing anti-Semitic persecution, he and his family abandoned Europe forever – settling down at the newly founded Institute for Advanced Study at New Jersey’s Princeton University. The visit to Palestine followed an invitation from Arthur Ruppin, director of the Zionist Organization’s Palestine Office in Jaffa, who thought the scientist’s visit would have “great propaganda value” not only for Jewish settlements but also for the Hebrew University. Einstein even spent a day in Singapore, specifically to raise money for the Jerusalem campus from Mannaseh Meyer, the wealthy leader of the Jewish community there. Einstein, however, did keep a record in his diary in German every day of his trip eastward – a total of 182 lined pages, some of them with his own drawings of things he observed. Now, this unique document has been brought to light, with extensive comments by Ze’ev Rosenkranz, senior editor and assistant director of the Einstein Papers Project at the California Institute of Technology in Pasadena and formerly curator of the Albert Einstein Archives at the Hebrew University. Published by Princeton University Press, the hardcover, $29.95 book – The Travel Diaries of Albert Einstein – presents 357 fascinating pages. Einstein referred to the news that he was selected to receive a Nobel Prize for Physics, but he did not attend the December 1922 ceremony because he was in the midst of his travels. Instead, a German diplomat spoke at the banquet and praised Einstein as both a scientist and a peacemaker. The telegraphic-style diary entries record Einstein’s musings on science, philosophy, art and politics, as well as his immediate impressions and broader thoughts on events such as his inaugural lecture at the future site of the university in Jerusalem, a garden party hosted by the Japanese Empress, an audience with the king of Spain and meetings with prominent colleagues and statesmen. Entries also contain passages that reveal Einstein’s stereotyping of members of various nations and raise questions about his attitudes on race. It includes facsimiles of the diary’s pages, accompanied by an English translation, Rosenkranz’s 77-page historical introduction, numerous illustrations and annotations. Supplementary materials include letters, postcards, speeches, articles, a map of the voyage, a day-by-day chronology of the visit, a bibliography and an index. Whatever is the reason, the diary has fortunately been published and opens a window on civilization a century ago, the state of the Jewish Yishuv in Palestine and Einstein’s personality. The physicist made five more trips abroad (to South America and the US) and kept journals for all of them, but this first volume of his travel diaries offers an initial, intimate glimpse into a brilliant mind encountering the great, wide world. Yet he was not a saint, but a human-being shaped by his childhood experiences, the culture and society that encompassed him as an adult and his prejudices, some of which seem xenophobic and embarrassing to the contemporary reader. His reputation of caring about the poor and stateless was even used later by the United Nations High Commission for Refugees to promote positive feelings for refugees. “A bundle of belongings isn’t the only thing a refugee brings to his new country. Einstein was a refugee,” was the slogan of its campaign. But although he was regarded as a peace activist, a Zionist, a democratic socialist and a world federalist, the diaries contain various generalized insults to people he had observed for only a few hours or days. His views of the Arabs and the Jews of Palestine are also variable and conflicted. He and his wife crossed the Suez Canal by ferry and then took a train on February 1 to Lod, where they were welcomed the next day by Zionist dignitaries, changed trains and went on to Jerusalem, staying with Sir Herbert Samuel, the High Commissioner. Yet this negative description of religious Jews should not surprise us. 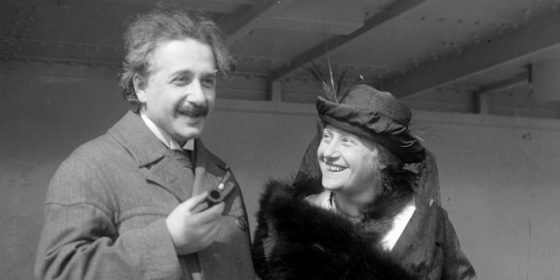 His parents, salesman and engineer Hermann Einstein and his wife, Pauline Koch, were secular Jews who sent Albert to a non-Jewish elementary school in Munich between the formative ages of five to eight years old. His observations at the Kotel were probably not very different than those of some secular American Jews coming to the holy site today for the first time. The physicist strongly supported the goals of labor Zionism, and he had great admiration for young Russian-Jewish pioneers in the collective kibbutzim and moshavim. He also enthused over the builders of homes and institutions in Tel Aviv (founded in 1909) on the shores of the Mediterranean Sea, the garden suburbs of Jerusalem and of the future site of the Hebrew University campus on Mount Scopus, where he delivered lectures: “The most blatant symbolic representation of Zionist efforts that would be of great benefit to the peoples of the region. Western knowledge was once again emanating from Zion,” wrote Rosenkranz. Additional points on the itinerary were the Mikve Yisrael agricultural school, the “Jewish Rothschild colony, Rishon LeZion,” the Reali School in Haifa, Bethlehem, Nazareth, the Jezreel Valley, the Nahalal “colony” under construction (“virtually all Russians”) and Tiberias. Today, the State of Israel has more Jews than any other spot on Earth and a sophisticated, productive and growing population and a healthy if imperfect society. One can only wonder after reading this diary what Einstein would have thought it he had had the opportunity to visit it today.